The summit achieved all that could be expected given the huge range of issues that separate Turkey and Russia. In the aftermath of Erdogan’s visit to Russia the danger of overly-high expectations is illustrated by an article by the veteran Russia watcher John Helmer. “The priority is the commitment from Turkey to stop attempts at regime change in Syria, the Russian Caucasus, and the CIS states, including Armenia and Tajikistan. This means the expulsion of Chechen fighters from their havens in Turkey and areas under Turkish control; closure of the Turkish-Syrian border for ISIS and other jihadis; and an end to Turkish support for the Azeri war against Armenia and for Islamic oppositionists in Tajikistan, Uzbekistan, and Crimea. Another Russian priority – the key to the wars which the Kremlin fought against the Ottomans for more than two centuries — is Turkey’s undertaking not to violate the limits of the treaties governing the straits between the Black Sea and the Mediterranean, and not to allow a permanent NATO naval deployment of Aegis missile systems, targeted against Russia in the Black Sea. No doubt this is an accurate wish list of what the Russians might want from Turkey in a perfect world. I cannot however believe that there was a single Russian official who seriously supposed Erdogan would agree to any of this, and especially not in return for a gas pipeline, a nuclear reactor, more Russian tourists, and the lifting of a Russian ban on the import of Turkish vegetables and tomatoes. There is no evidence that the Russians ever demanded it, precisely because they would have known that Erdogan would never agree to it. Erdogan is currently very angry with the US and grateful to Russia and his previous record shows that he has no feelings of hostility to Russia. However it is simply unrealistic to expect him to overturn decades long or even (as in the case of the Straits) centuries long policies in a few short days just to please the Russians. He would be making his position in Turkey untenable if he did. That does not mean that the summit meeting was a failure. Simply because Russia and Turkey have not become allies and remain deeply in conflict on many issues it does not mean that they cannot develop close relations on questions where they have a mutual interest. The gas pipeline and nuclear reactor projects benefit Russia as they do Turkey, as in a rather different way do the agreements about tourism and vegetable and tomato imports. To argue otherwise is to say that it is better for Russia to have bad relations with Turkey rather than good ones, which is a view hardly anyone in the Russian government would share. If the summit meeting is understood in that way then it was a success, paving a possible way for further convergence on other issues including conceivably a free trade agreement and even eventually Syria. Lastly there is one specific point I do want to make about one particular matter which has been widely discussed about the summit. This is Putin’s supposedly poor body language which Helmer and others see as a sign that the summit from Putin’s point of view was a failure. Studying a leader’s body language is a fully legitimate way to assess the results of a summit. 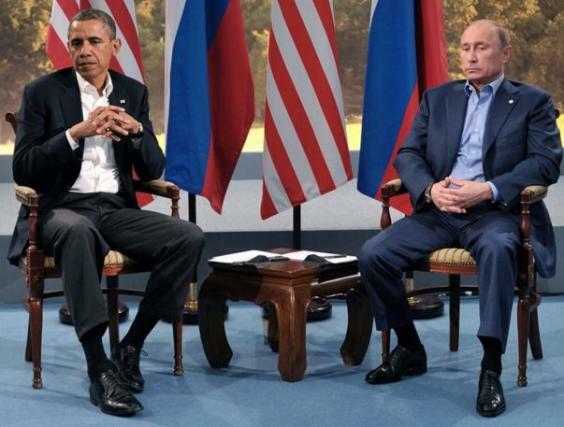 Obama’s and Putin’s bad body language during their meetings is a good sign the two men don’t get on with each other. However in the case of the meeting with Erdogan there were perfectly understandable reasons why Putin’s body language might be poor which had no connection to the summit itself. Firstly it is a near certainty that Putin was tired and felt under pressure. On the previous day he had met with his security advisers early in the morning and had then flown to Baku for a complex and probably difficult meeting with the Presidents of Iran and Azerbaijan. He then had to fly to St. Petersburg for an even more difficult meeting with Erdogan on the following day whilst somehow also finding the time on the same day to have a probably lengthy telephone conversation with British Prime Theresa May. Whilst meeting with Erdogan he would have known that on the following day in Moscow he had a scheduled meeting with members of his government to discuss economic and education policy, a scheduled video conference with Prime Minister Modi of India, and a scheduled meeting later that day with President Sargsyan of Armenia, to be followed by another press conference. Throughout all these journeys and meetings he would have needed to be kept informed about the situations in Aleppo and Crimea, with the security crisis in Crimea especially causing him particular worry. In light of all this it is not surprising if during his meeting with Erdogan Putin at times looked tired and distracted. In all the oceans of words said and written about Putin scarcely any mention is ever made about how hard he works. Beyond this it would have anyway been politically unwise for Putin to appear too obviously pleased to meet with Erdogan. The anger in Russia over the SU24 incident has by no means fully abated. Some of that anger is almost certainly shared by Putin himself. It might be easy for Erdogan to talk of his “friend Putin”. It would not be so easy for Putin to talk of his “friend Erdogan” even if he felt inclined to do so, which he almost certainly doesn’t. All in all, if one puts some of the excessive expectations which preceded the Erdogan – Putin summit to one side, it can be seen that the summit went just about as well as could reasonably be expected, and as was in fact predicted. The thing to take away from the summit is that Russia and Turkey now have an active political dialogue and burgeoning economic relationship. It is not a realignment or an alliance, but that was never likely and was never demanded or on offer. Both Putin and Erdogan are almost certainly pleased with what they have achieved, even if there is still much work to do.